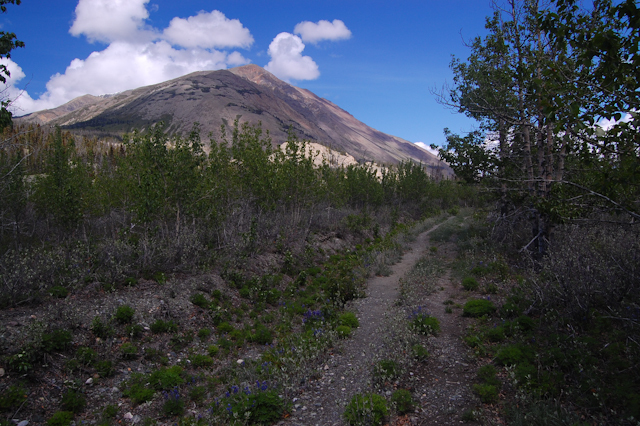 This trail follows an old road up into the alpine, ending above the Sheep Creek Valley. 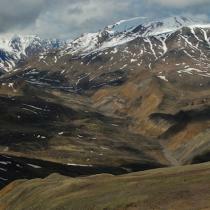 The road is long but the ascent is gradual and aside from its length is an easy hike. Note there is a creek crossing. 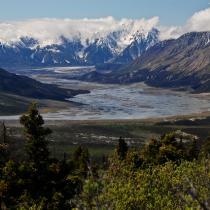 The views along the trail stretch down the Slims River Valley all the way to the toe of the Kaskawulsh glacier. 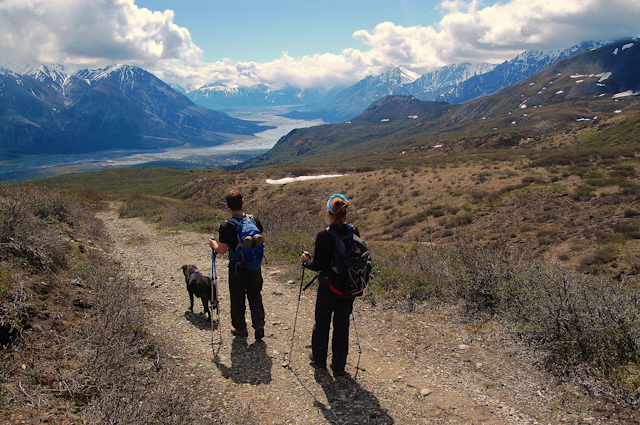 At the end of the trail, the views of Red Castle Ridge and the Upper Sheep Creek Valley are an added reward. 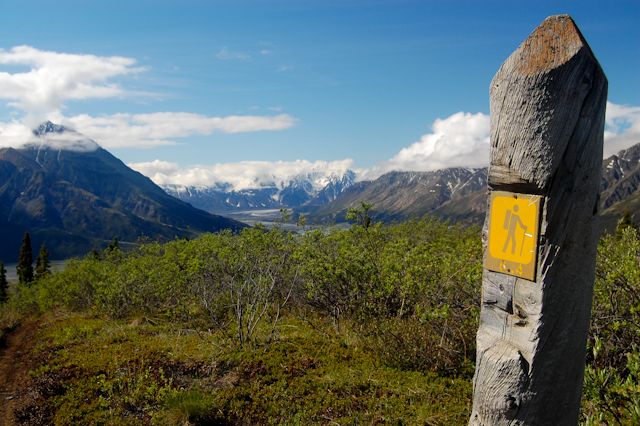 From Haines Junction, continue north on the Alaska Highway for about 70 km until you cross a bridge and see the Thachal Dhal (Sheep Mountain) Visitor Center. 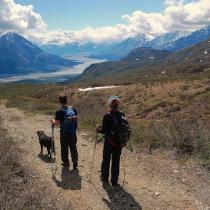 Immediately after the visitor center, make a left onto Sheep Creek Road. 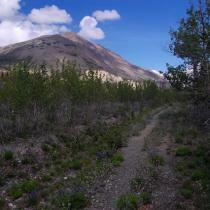 Follow this gravel road for about 2.5 km until you reach the parking lot and trailhead. 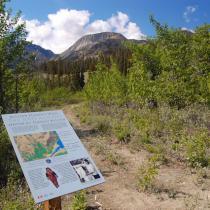 Walk through the gate at the parking area and head straight (do not take the right turn which has an information plaque for Sheep Creek trail). 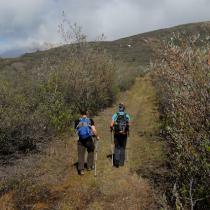 You will be following an old road for most of the trail. The road is wide and easy to follow. 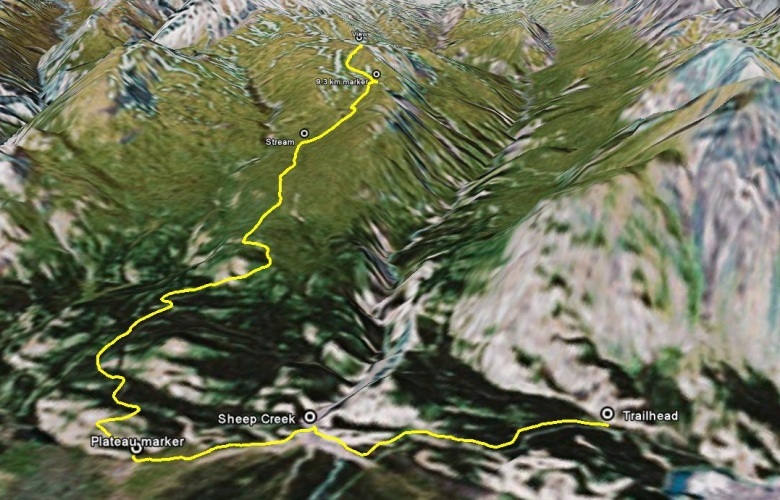 After about 1.5 kms you will reach an open area and about 400 metres later will come to Sheep Creek. 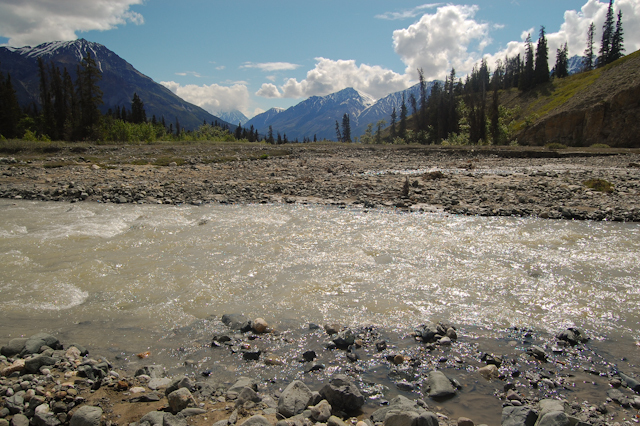 To cross Sheep Creek, it is best to find a wide, shallow spot and take off your shoes and socks (you can bring light sandals with you to avoid slipping on the rocks and hurting your feet). 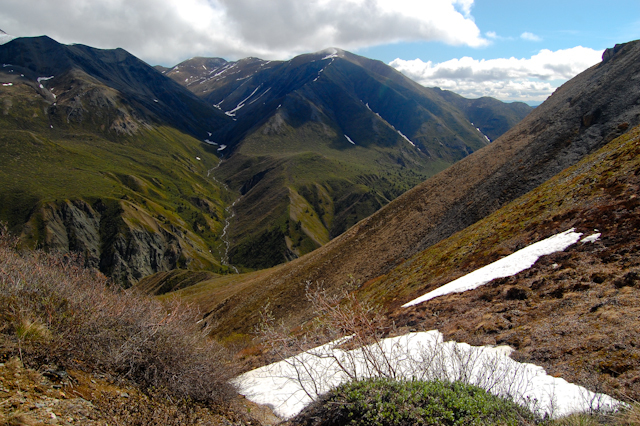 After Sheep Creek, continue along the road for about 1 km until you reach a wooden signpost with 'Plateau' on it. 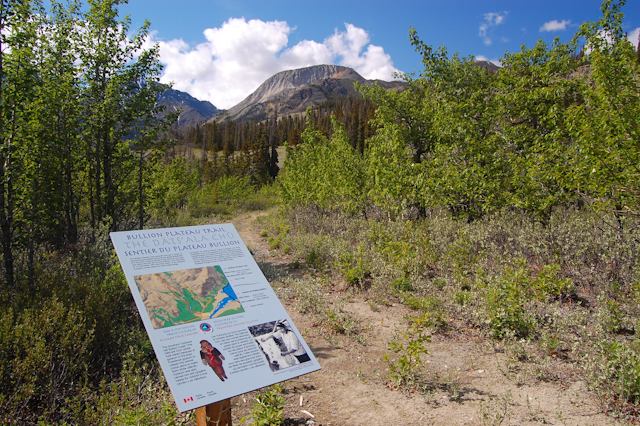 On your right there is an information plaque for Bullion Plateau. Follow the road to the right as it winds up into the trees. 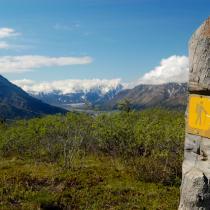 You won't be in the trees for long and the views will start to open up, especially at the 6.4km signpost. 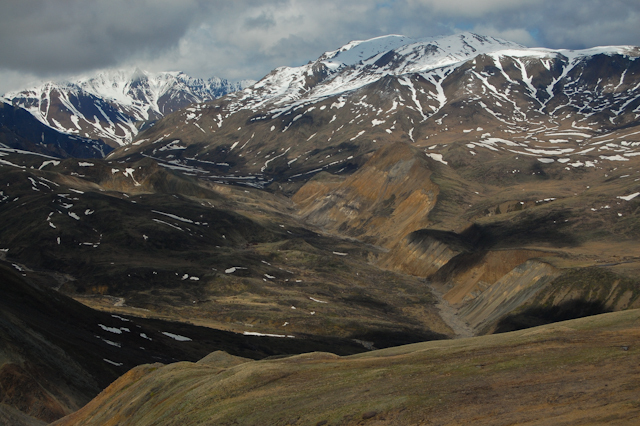 From here, you can see all the way down the Slims River valley and can also see the toe of the Kaskawulsh glacier. 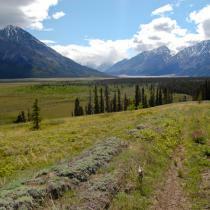 This amazing scenery will be your view for most of the way down the trail. Continue up the road which will be bordered by willow thickets. Make lots of noise here, as you may notice evidence of bears in this area. 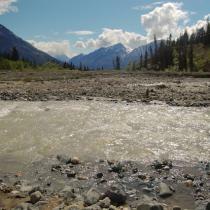 At the 8km mark there is a small stream where you can get water (make sure to treat it). You will reach the 9.3 km signpost at the top of the road. 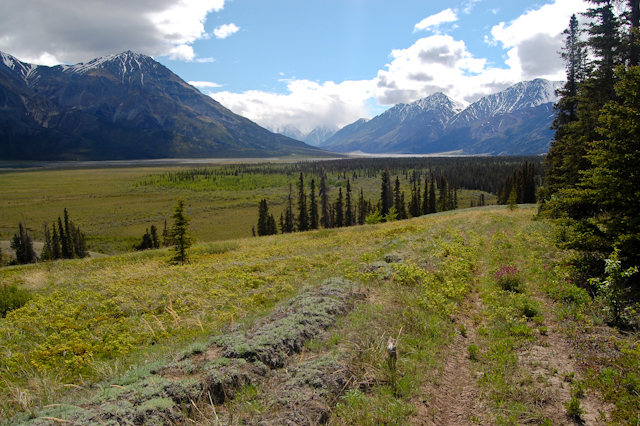 Here you have 2 options: you can stay right and continue along the road and wrap around towards Sheep Creek, or you can leave the road and head straight up the open grassy hill in front of you. If you have time, you can even make a circle route out of these two options. 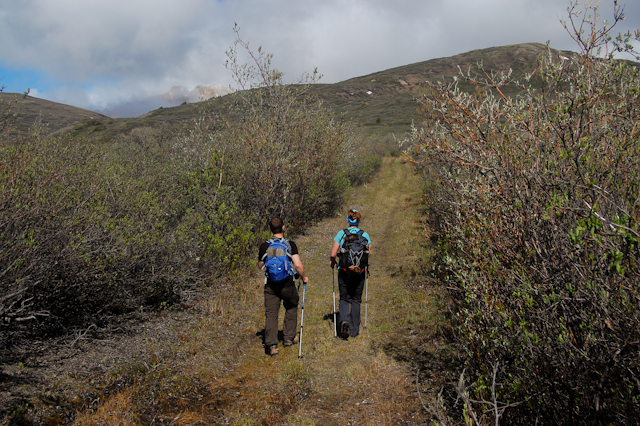 If you decide to continue following the road, it gets a little overgrown but is still easy to follow. 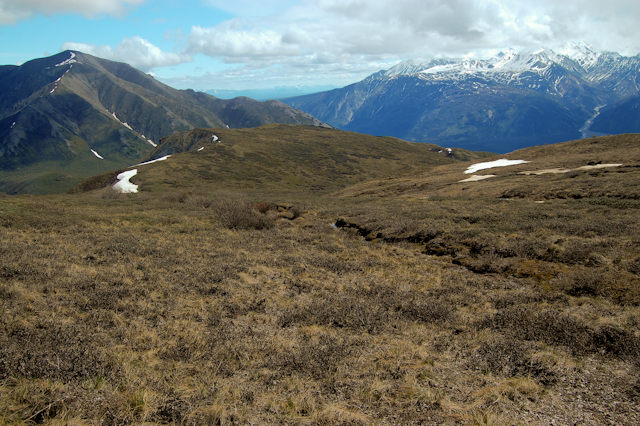 If you decide to walk straight up the hill, you can make your own way or stay slightly to the left and follow a path that has been cut deep by running water. 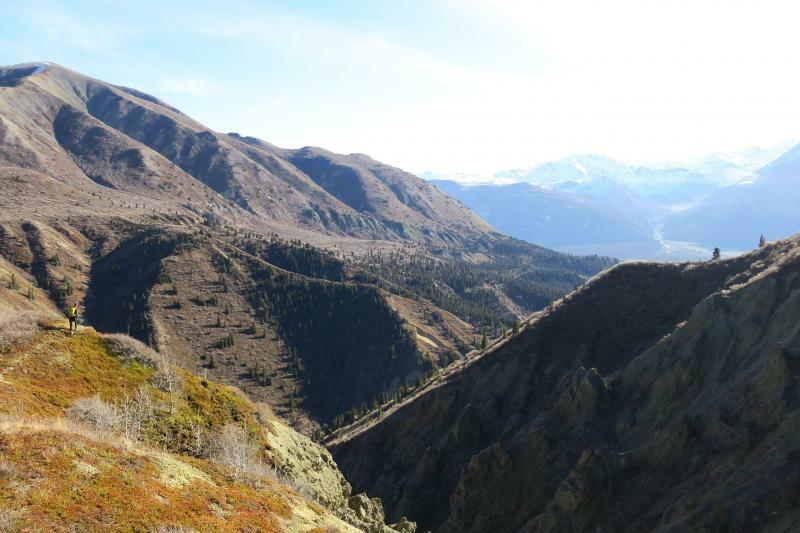 Either way, you will soon get a view of Red Castle Ridge (the unmistakable sharp, red ridge on your left) and a view over the expanse of the Sheep Creek Valley and the surrounding mountains. From here (roughly the 12km mark), you can make a circle route back to the 9.3km signpost or follow the same route back down. 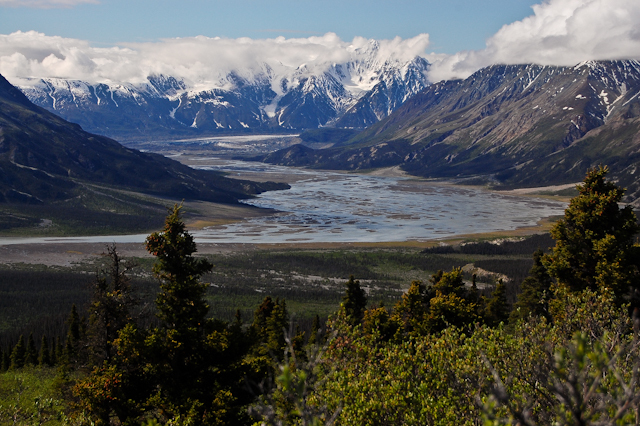 On your way down the trail you will have a great view down the Slims River Valley and the delta towards Kluane Lake below. 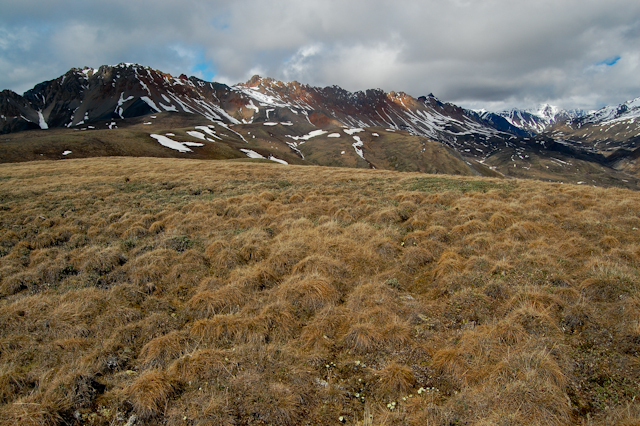 Have you been to Bullion Plateau lately? 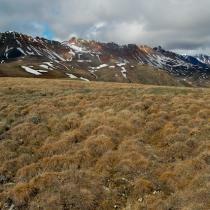 Hiked to Bullion Plateau on Mon Oct 10th. 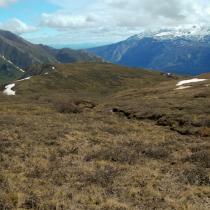 We followed the road to the 9.3 km marker and headed up higher for an improved view of Red Castle Ridge. We decided to try to connect Bullion Plateau with Sheep Mt Ridge and dropped down soon after the 9.3 km marker at GR 278677 and stayed in the drainage for a short bit before traversing SE to a plateau and then following ribs (sheep trails) down to an obvious bend in the river GR 290680 that connects to the W ridge of Sheep Mt ridge and then back up the W ridge (more sheep trails) to intersect with the actual Sheep Mt Ridge trail. 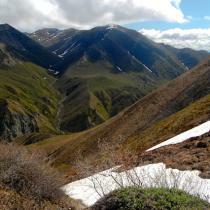 It is a route and can get a bit steep but makes for a great day out in the mountains that adds a bit of spice & variety. Fun & great views!